Why Does This Mummy Appear To Open And Close Her Eyes? 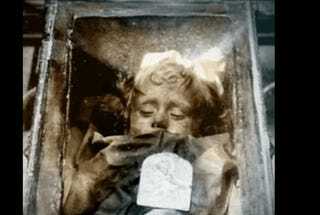 In Siciliy, there's a very spooky mummy of a girl who died in 1920. Occassionally, she can be seen to open and close her eyes. Italian researchers now say there's a perfectly reasonable explanation — and it has nothing to do with her being among the undead. One of the world's best preserved mummies, Rosalia is the most famous among some 8,000 thousands mummies lining the catacombs beneath the Capuchin convent in Palermo, Sicily. Nicknamed "sleeping beauty," she looks like a 2-year-old baby taking a nap. Poking above a blanket, her peaceful face is framed by curly blond hair, while a ribbon is still tied around her head. Although amazingly mummified, Rosalia doesn't open and shut her eyes. "It's an optical illusion produced by the light that filters through the side windows, which during the day is subject to change," Dario Piombino-Mascali, curator of the Capuchin Catacombs, said in a statement Thursday. He noted the mummy was moved slightly and shifted to a horizontal position in a humidity-free glass coffin. The new position makes it easier see Rosalia's eyelids. "They are not completely closed, and indeed they have never been," Piombino-Mascali said. The anthropologist unearthed Rosalia's real secret in 2009, when he found the mysterious formula used for her amazing preservation. While most of the mummies buried in the catacombs were treated by the monks and basically desiccated by the dry environment, Rosalia was mummified artificially. To preserve her for eternity, Rosalia's heartbroken father turned to embalmer Alfredo Salafia, a Sicilian taxidermist and embalmer who died in 1933. Salafia never revealed the chemicals used in his preservative. In 2009 Piombino-Mascali found a handwritten manuscript in which Salafia listed the ingredients used to mummify Rosalia. The formula read: "one part glycerin, one part formalin saturated with both zinc sulfate and chloride, and one part of an alcohol solution saturated with salicylic acid." The procedure was very simple, consisting of a single point injection without any drainage or cavity treatment. The concoction worked perfectly. Formalin killed bacteria, glycerin kept her body from overdrying, salicylic acid killed fungi, while zinc salts basically petrified Rosalia's body. The new glass case will help preserve Rosalia for many more years. "It was designed to block any bacteria or fungi. Thanks to a special film, it also protects the body from the effects of light," Piombino-Mascali said. He hopes that from now on tourists will stop taking pictures and making up "totally unfounded stories" about the child mummy.